Char, Weddy, and Nuell are excited over their discovery on the strange planet Pleisto but also terrified, for the leader of their expedition, Professor Joher, has disappeared. Nuell and Weddy, Joher' children, are concerned for his safety, while Char, his research assistant, feels not only worried but responsible for all of them. He realizes that these prehistoric people may have carried off the professor-and may even have killed him. 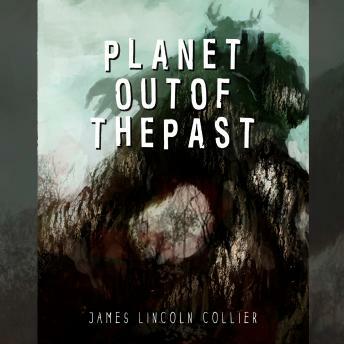 The three set out to find the professor, and their search leads them through a frightening world, where they must fight for their lives every day, against mastodons and jaguars as well as Pleisto's prehistoric inhabitants. They befriend a wounded hunter, a man who is like their own ancestors from millions of years earlier, and hope that he will lead them to the professor. As their journey progresses, Char is thrilled to have the chance to study prehistoric humans so closely, but he is disturbed by the violence of everyday life on Pleisto, by its uncomfortable similarity to life on Earth, and by his own feelings of competition and aggression. In an exciting climax, he learns about human courage, love, generosity, and cooperation.